– The virus is absorbed in to Aluminium Hydroxide gel [Al (OH)3] concentrated, inactivated with 0.3% of formaldehyde and adjuvanted with saponin. – The vaccine is available in 50ml vial of 10 doses or 100 ml vial of 25 doses. – Vaccine should be stored at a temperature of +4 ºC. Don’t freeze the vaccine. – Shake bottle before use. – Inject 4 ml per cattle subcutaneously preferably in dewlap region. – After puncture of the stopper the whole bottle of vaccine must be used within 24 hours. – Do not vaccinate the cattle under 6 months of age. – Since the season of outbreaks in Ethiopia is generally between November and January, it is advisable to vaccinate animals before this period so as to obtain sufficient level of antibodies when the risk of outbreak is maximal. – Swelling may occur at the place of inoculation and persist for a few weeks. 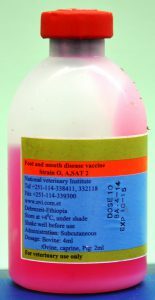 – Develops 2 weeks after vaccination and may last for six months. Vaccinate only apparently healthy animals.